Lately I’ve been in the happy position of having as much work as I can keep up with. The downside means that I’ve been neglecting my blog. However, I made time today because I want to share an accomplishment and to talk about a topic I’ve come to care about very deeply: Digital policies. A couple of years ago, I never gave much thought to digital policies, and, if I did, I certainly wouldn’t have thought they applied to me as a freelance writer. Since then, I’ve come to learn just how wrong I was. 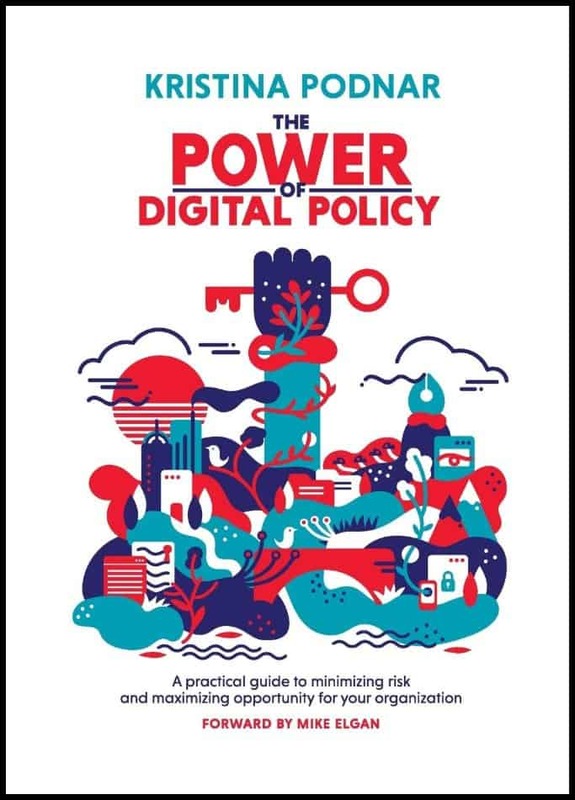 The Power of Digital Policy: A Practical Guide to Minimizing Risk and Maximizing Opportunity for Your Organization, by Kristina Podnar. #1 The Americans with Disabilities Act applies to my website. Make sure your site can be navigated by a keyboard. You can find more information here: W3C: Website Accessibility Initiative. #2 I don’t have to worry about user-generated content (UGC) because the user freely chose to share it. The user’s consent isn’t always enough. Images are a good example. A user can give you permission to publish and share an image from their role as photographer, but they can’t grant you permission to use the “image and likeness” of any people in the photograph. To be safe, you’d have to get permission from each individual pictured. Publishing an image that includes a brand’s logo or registered trademark (someone in a crowd shot wearing a Nike hat, for example) could, in theory, be considered trademark infringement. While it may be unlikely that a large brand would bother suing a solopreneur or SMB, problems crop up when businesses experience rapid growth and forget that they’re no longer too small to be a target. That’s one reason it’s important to institute sound digital policies from the beginning. If a user posts a picture or video of someone using your product in an unsafe way, allowing it to remain on your site could be considered an endorsement, exposing you to liability for any associated injuries. You can read more about the risks of UGC here: What you need to know now about the risks of user-generated content. #3 I need to understand the GDPR no matter how small I am or where I’m located. The long arm of the General Data Protection Act (GDPR) isn’t bound by geography. It’s based on the EU citizenship of the individual. So, if your email list includes an EU citizen (look for those .eu addresses), you’re just as responsible for protecting their personal data as if you were a large organization headquartered in the EU. Since the law is still relatively new, it’s unlikely that regulators will be seeking out small businesses in the U.S. right away. But if your business starts growing rapidly, your risk grows right along with it, which is why you should make GDPR compliance (along with similar laws in other countries) a priority right now. #4 I (or my organization) can drive traffic and gain exposure by joining the social media conversation on controversial topics. Confession time: This was a trick question. Is it important to your branding to take a public stance on the topic or issue? If not, what are the chances that things will go wrong…that you’ll end up doing your brand more harm than good? Are there any legal risks, such as posting before you have all of the facts? Are you conflating your personal opinions with those of your business? The siren song of social media can be strong. Even if it’s just you and your blog, a sticky note on your monitor that says, “Step away from the keyboard” can remind you to take a breath and think before you do something you’ll regret. For more information, see: How the Covington High Incident Makes the Case for Digital Policies. #5 Gated content is a great way to build your email list. For years, using gated content has been considered a “best practice” for list-building, but the GDPR put a stop to that. It requires you to get separate consent for each use of an individual’s personal data. That means that, if someone gives you their email address to download a white paper or ebook, you can’t just automatically add it to your email list. You have to get separate consent to do that. So, while that doesn’t mean you can’t have gated content, it does mean you need to really think about what you’re trying to accomplish and how it will help you. You might decide that the thought leadership you develop by leaving your best content available to everyone is more valuable than collecting email addresses you can’t use for marketing purposes. That’s just a very small taste of what’s in this book, but I hope it’s enough to make you realize just how important digital policies are, even if it’s just you and your keyboard. And the bigger you get, the more complex (and more important) your policy decisions become. So don’t be like me, blogging away in ignorance for far too long. Be like Kristina, and learn how digital policies can help you avoid risks while still taking advantage of opportunities.